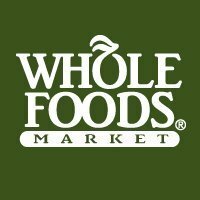 Whole Foods Market is celebrating their annual Muchos Mangos event the entire month of April, featuring amazing ataulfo (ah-tah-ul-foh) mangoes from Mexico. 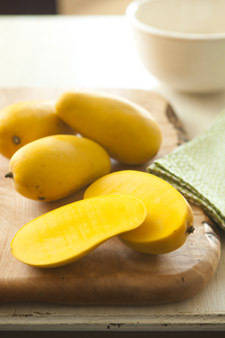 This variety of mango is sweet and juicy, with a thin pit and no fibrous strings. They're basically a little taste of spring, with a gorgeous vibrant-orange interior. This variety of mangoes is in season from March through June, so they're perfectly suited for use in all sorts of warm-weather dishes! Because they aren't fibrous, they're easy to blend for using in smoothies and marinades. They're also great cubed in fruit salads and desserts. Heck, they're great eaten by themselves out of hand! If you click the link above, you'll find a very informative video that shows how to cut and prep the ataulfo mango. It's really easy once you do it a time a couple of times! Once you cup open the mango, you'll find golden-orange fruit inside. It's so soft and luscious that you can eat it right out of the shell with a spoon if want. That's how I enjoyed a few of the mangos that I purchased. The flavor is deeply sweet and spicy...like a tropical breeze on a remote island beach! I’m teaming up with Whole Foods to celebrate Muchos Mangos and create a healthy Springtime dinner that puts these sweet, juicy mangos front and center. My Tropical Jerk Shrimp-Mango Salad is a light, yet filling, main dish salad that will transport you to your favorite tropical beach at first bite. But, you don't need a passport or an exhausting plane trip! This salad is full of bright flavors from cubes of mango and avocado, spicy Jerk-seasoned shrimp, candied cashews, bits of dried pineapple, and tangy feta cheese. This salad was ready to eat in less than 30 minutes…and it was bursting with guilt-free flavor. Let me show you how easy this salad is to whip up for dinner this week! (1) Toss 4 cups of your favorite salad organic salad greens with your favorite dressing. I used a natural raspberry vinaigrette. Divide the greens evenly between two large plates. Toss 1/2 lb. shrimp in 1 tbs. jerk seasoning and quickly sear in a bit of olive oil in a non-stick skillet. (2) To assemble the salads, top each salad with the following ingredients: 1/4 cup dried pineapple bits, 1/3 cup chopped candied cashews, 1/3 cup feta cheese, 1/2 a small diced avocado, 1/2 cup dice ataulfo mango, and half of the shrimp. This colorful salad is a tropical vacation on a plate! The fiery shrimp is tempered by the creamy avocado and sweet mango, the nuts and pineapple provide a bit of texture, and the feta brings a tart saltiness to round out the flavor profile. Add it all up, and you’ve got a winner of a salad on your hands. It’s as pretty to look at as it’s refreshing to eat! You can feel free to serve this salad with warmed flour tortillas on the side for making some delicious wraps, but we enjoyed ours with crusty oven-warmed whole-wheat bread from the Whole Foods bakery. 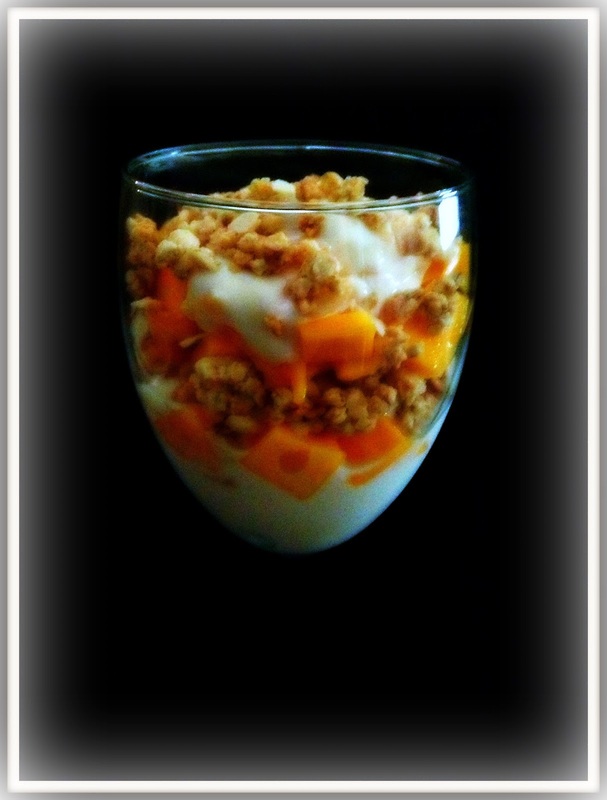 For dessert, I made light and simple mango parfaits by layering cubes of ataulfo mango with mango-flavored Greek yogurt and a bit of low-fat granola from the Whole Foods bulk aisle. Our dessert was ready to eat in just a few minutes, and it was so gorgeous...not to mention low in fat and high in calcium and vitamins! Muchos Mangos is going on at your local Whole Foods Market until the end of April, so make sure to stop by and pick up some of these delicious mangoes and give them a try! Disclosure: Whole Foods provided me with a gift card to purchase atuolfo mangoes and the other ingredients to create the Springtime meal featured in this article. All opinions expressed are my own.